There is no one size fits all when it comes to SharePoint governance. It’s a tricky component of SharePoint to get under the belt for all organisations. Start small and grow dynamically. Without trying to over-simplify the process, there are basic steps that need to be followed for all types of governance. 1. Document – decide what you want to govern and why and document it. (Get some samples here). Think about turning the governance plan into a wiki instead of a Word document. It’s far easier to maintain, see point 6 for more. 2. Communicate – you need to communicate to your user base on a weekly basis at least. Tell people about the governance plan, changes to the platform, tips and tricks, problems and successes. This will buy you plenty credibility and help with user adoption. 3. Enforce – there’s no point in writing a governance plan and not enforcing it. It has to be communicated to all the users who need to acknowledge and understand the plan. There needs to be consequences for people breaking governance rules. 4. Meet – you need to have a governance forum in place to manage the platform. It needs to have representatives from each of the major business areas as well as IT. Meet minimum once a month and don’t skip a meeting or you’ll battle to get it off the ground again. 5. Record – have minutes, agendas and tasks for every governance forum you have. When users escalate issues to the governance forum you may need to prove later on how it was resolved. 6. 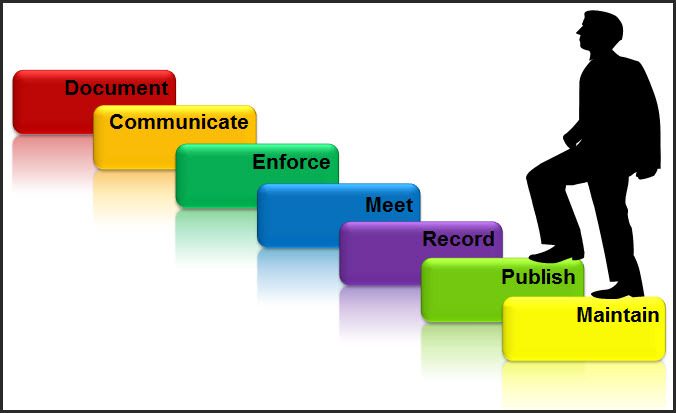 Publish – the governance plan, minutes and agendas all need to be available to the user base. Create an evangelism site open to everyone in the company and publish everything SharePoint, then communicate the link to everyone. 7. Maintain – a governance plan is never finished. Review it at least bi-annually and adapt it to your growing needs. This will especially be relevant if you’re upgrading from 2007 to 2010.